I’ve always loved the crunch of coleslaw as a side dish for our meals. I’m also pretty much into making a mishmash of ingredients on a nightly basis for our salads. 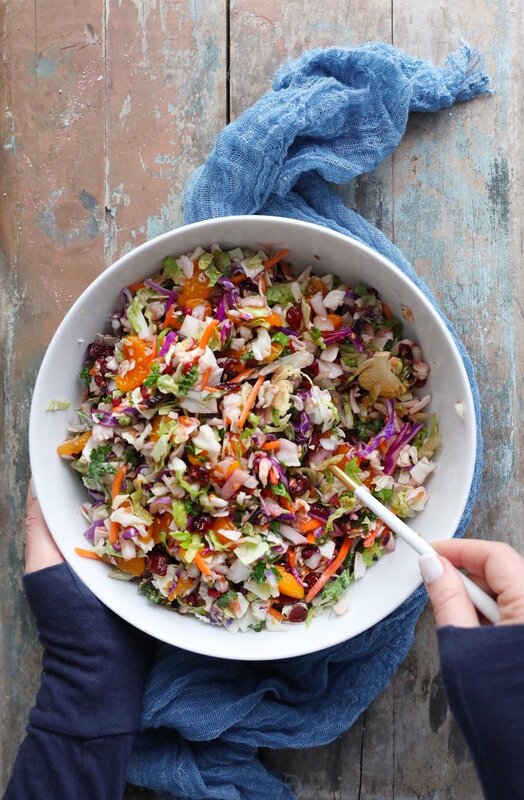 This recipe is a combination of a slaw and a salad thus allowing me to aptly make up a name for it – SLAWLAD. I tend to throw cabbage into everything. Especially the purple one because, well, it’s pretty darned gorge in photographs plus it adds that crunch and punch of goodness into your dish. Most of my salads have something unusual thrown in. Even though this is a slaw and a salad, it could easily be served as a main dish as well as a side. On occasion, I’ve added protein into this and it’s absolutely perfect to serve at any meal. 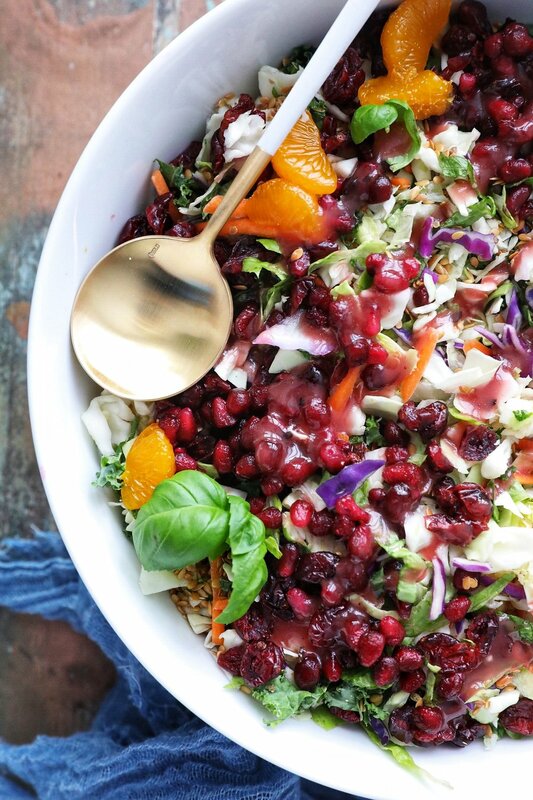 This pomegranate “slawlad” is crunchy, sweet, tart, colorful and just plain simply beautiful. It literally takes less than a few minutes to come together and will brighten up any table. A burst of color, texture and sweet tart flavour comes from the pomegranate arils. I have to admit, I love using pomegranate in recipes but hate wrestling the seeds out of them. You can definitely cheat and buy pomegranate arils in small containers which can be found in the refrigerated section of most supermarkets. Pricey but 100 percent worth it. The arils lend the perfect amount of sweetness to this recipe and its enhanced even more with the addition of pomegranate to the dressing. This is NOT your average greasy, heavy, mayonnaise dunked slaw. It’s more like your dream-come-true slawlad. Place all ingredients in a large serving bowl. Drizzle with dressing and place in fridge for 2 or 3 hours to chill. The dressing will soften the slawad. Serve as a main or a side. Mix all ingredients in a blender starting at a low speed and gradually increasing to high until the dressing is very smooth. About a minute or two. Drizzle over any salad recipe. Can be stored in an airtight container for up to 5 days in the fridge.